This dictionary is a fully revised version of The Great Tibetan-Chinese Dictionary (bod rgya tshig mdzod chen mo). The basis for the revised edition is the very first edition of the dictionary, published on paper in the 1970’s in China. We produced and published this revised edition during the early 1990's in Nepal. It is noteworthy that there are other versions of this dictionary available in various places. However, these were all made from an input of the original done by the Asian Classics Input Project which we checked entry by entry and found to be highly corrupt and with significant omissions and additions. Be warned that all the other digital versions available these days still contain all the corruption, omissions, and additions! Having discovered that, we input the dictionary ourselves then spent two full years revising the content, correcting many mistakes, especially in the Sanskrit, in the original. 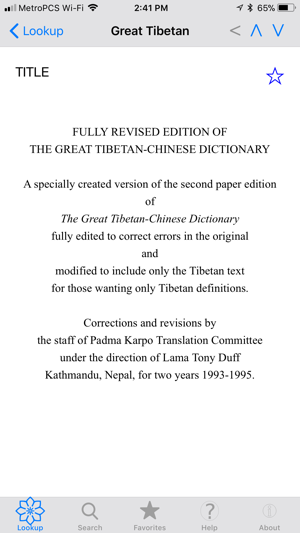 Then we made another major change to the dictionary; the original comes with definitions in both Tibetan and Chinese but we wanted a version with Tibetan only. Therefore, we carefully removed the Chinese text. 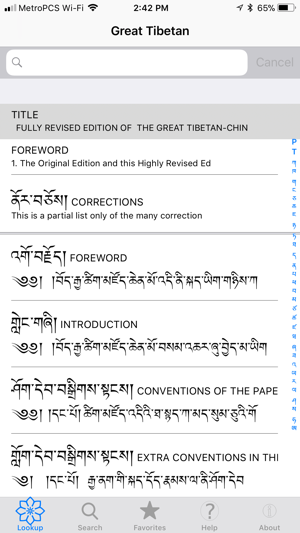 The result, available here, is an entirely new version of the originally dictionary with substantial improvements to the text and with the feature which many Westerners had requested of being Tibetan-Tibetan only. The dictionary is not easy to read. Definitions tend to be very short and terse so, unless you are already well-versed in Tibetan language, it is easy to go astray based on what is said. However, the dictionary contains over 55,000 entries, more than any other single dictionary and contains many useful examples. Thus, this is not a dictionary for beginners; it is a real Tibetan-Tibetan dictionary made for Tibetans which demands a good knowledge of the language to be of use. Nevertheless, it is an essential reference for anyone whose Tibetan is sufficiently good to be able to use it successfully. Certainly translators should be using this dictionary and should be using it instead of the many other copies available on the internet today. Improved iPhone text formatting. Full support for iOS 11. Fixed full text search issues. Addressed navigation issues. © TONY DUFF 2000-2017. All rights reserved. Padma Karpo Translation Committee.